EAST HARLEM — Police are searching for a 12-year-old East Harlem girl who went missing Monday. 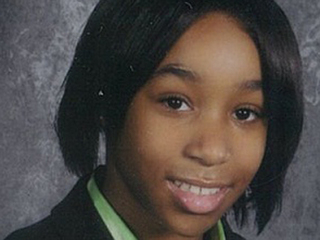 Zakyyah Copeland-Taylor was last seen Monday around 4 p.m. near East 113th Street and Second Avenue, the NYPD said. Copeland-Taylor is described as standing 4-feet-11, weighing 110 pounds, with brown eyes and shoulder-length black hair, police said. She was last seen wearing a blue sweater, blue jeans and white sneakers. Anyone with information about her whereabouts can call Crime Stoppers at 1-800-577-TIPS (8477). You can also submit a tip by logging onto the Crime Stoppers website at www.nypdcrimestoppers.com or by texting their tips to 274637 (CRIMES) and then entering TIP577. The nation’s second-largest Indian tribe said on Tuesday that it would not be dictated to by the U.S. Government over its move to banish 2,800 African Americans from its citizenship rolls. According to Pike Research, a market research and consulting firm that provides in-depth analysis of global clean technology markets, by 2015 the United States will be the world’s largest market for electric vehicles . Ol’ boy is creating controversy with his new book. I assume that he doesn’t want his black wife to decide to take his advice? From NBC Bay Area : “‘Don’t marry down. The University of Wisconsin-Madison responded Tuesday to a pair of studies that suggest the university’s admissions to its undergraduate and law school programs favor African Americans and Hispanic students over students who are white or Asian. Four African-American civil rights groups are trying to join Illinois Democrats in the legal defense of a newly drawn legislative district map. The Rev. C. Jay Matthews , regarded as one of Cleveland’s most influential civic activists and a giant voice on the national stage for social justice and civil rights, was charged Tuesday in federal court with stealing money meant to pay taxes on his church employees’ wages. On their way out of the meeting, they went so far as to flip over the portrait of Commissioner Keith James, who is black and set the motion against their proposal. Jackie Kennedy’s disapproving opinions of a host of public figures – including “phoney” Martin Luther King – have been revealed in previously unreleased tapes. The man who predicted the 1987 stock market crash and the fall of the Soviet Union is now forecasting revolution in America, food riots and tax rebellions all within four years, while cautioning that putting food on the table will be a more pressing concern than buying Christmas gifts by 2012. Celente says that by 2012 America will become an undeveloped nation, that there will be a revolution marked by food riots, squatter rebellions, tax revolts and job marches, and that holidays will be more about obtaining food, not gifts. The topic of race was front and center during a public hearing held before the Howard County Board of Education Study Commission, which has the job of deciding the fate of how the county’s Board of Education is elected. African-Americans who have slightly elevated blood pressure and don’t do anything to change their lifestyle are more likely to have high blood pressure one year earlier than whites with prehypertension, according to a study published Monday. Kevin Greene is the great-great grandson of Frederick Douglass and is a re-enactor for the Thirteenth U.S. Colored Troops.